Michelle Russell began the TOTT (Techsploration: Orientation to Trades and Technology) program in January 2013 after speaking with her cousin about new opportunities. Like many students starting a new something new, Michelle originally felt a little out of place but she quickly adjusted and found her classmates to be welcoming. The TOTT program gave Michelle the opportunity to explore various trades that would help her make an informed decision as to what her future career would be. 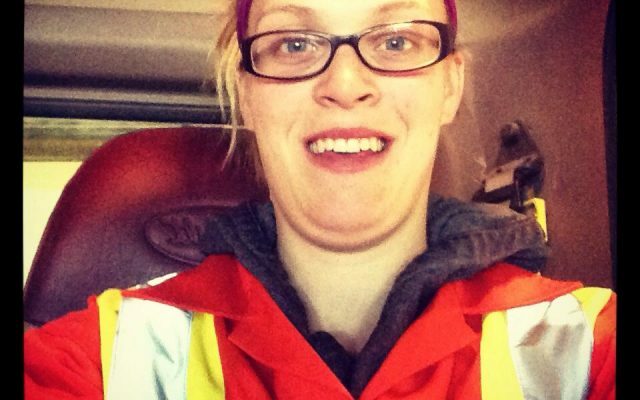 Michelle began the Heavy Duty Equipment Technician (HDET) program at the college of the North Atlantic in Happy Valley-Goose Bay in September 2013. During the TOTT program she learned her love for hands on work. “It was something that I found I enjoyed the most. It was a little weird going into the program being a female because some guys feel that females should not be in that sort of work atmosphere” says Michelle. A classroom complied of half men and half women made up the ideal conditions for learning and comfort levels. In May 2014, she completed the program and is currently working as a first year apprentice. “Tonia was huge help in finishing the program, without her help and advice I would not have gotten this far” she says. Michelle advises other women interested in the trades or technology programs to “Keep your head held high and do not worry what other people have to say about it”. Now a first year apprentice, Michelle enjoys working with Pardy’s Waste Management a local company in Happy Valley- Goose Bay. Admittedly her success didn’t come without struggles. As mother of an infant says it was difficult to leave her daughter every day but says knew she was creating a better life for both of them. “My favorite part of my job is working with people who are there whenever I need a hand. This is a career that requires attention, safety is a big thing. I feel safe in my workplace. People are always watching out for one another” says Michelle. Working with open minded coworkers is a key to a good working environment says Michelle. Currently, her work includes Water Trucks, Vacuum Trucks and Roll Offs. “I would make the same career choice again, I would also like to become an operator at some point” says Michelle.